Simple, quick and challenging lunch time yoga. Each 30-minute class will focus on a specific body part to strengthen, align and make space. 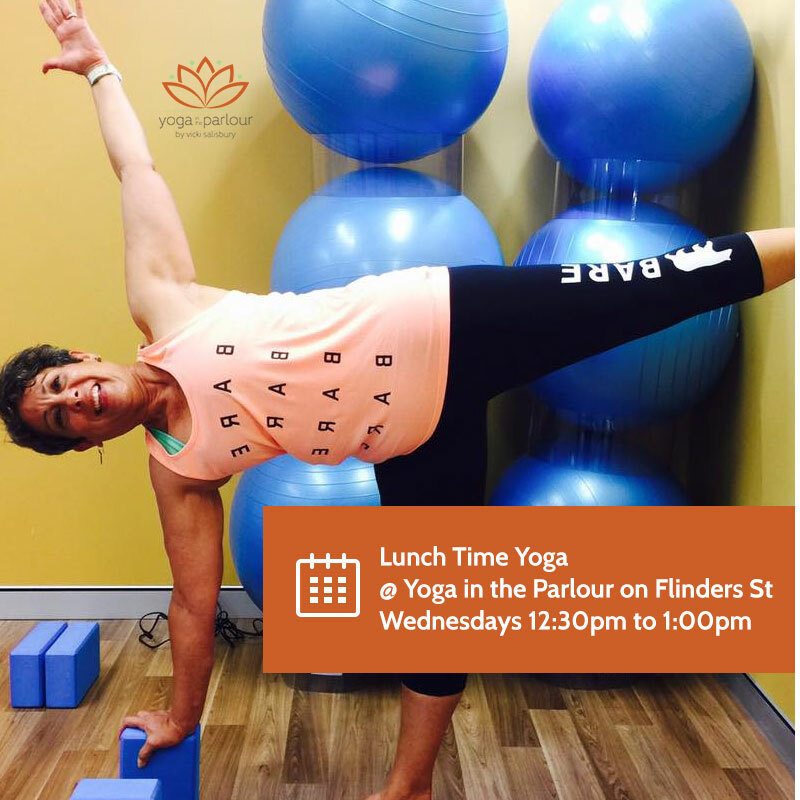 Life can be busy, and yoga in the parlour can help you to stay strong and resolute to your practice with group classes. Group classes connect you to your own being and to like minds. Group yoga classes focus on the student’s whole being and the “stressors” impacting our bodies. Many of us spend allot of time alone, although it may not feel like it as we race through the day, catching up with Facebook and posting on Instragram. But scrolling online is a solitary activity. In our highly stressed pace we loose track of the moments that makeup a healthy life. Technology, over work and rushing can isolate us from engaging in meaningful activities that connect back to our core values and our community. Everything is better shared and nothing can compare to attending a face-to-face yoga class with like-minded yogis. Attending group classes with structured moves will guide you through asana postures and help you to live better in your body. We will begin each class with a short meditation, followed by pranayama and asana. I approach group classes as a path toward becoming more loving and compassionate to yourself and others. Each group class is different and each lesson is designed to have holistic and positive effects on specific muscles, connective tissues, internal organs, bones, physiological and emotional systems. Group classes can lead to developing the most benefit possible for each student’s practice. Attention to proper alignment in the foundation postures is key to progressing toward strength and healing. I will supply various equipment such as, blocks, blankets and bolsters to help students get it right from the start. To add to the classroom experience and have fun, I share information on yoga theory, history and mythology. Context underpinning postures and the benefits gained from doing them provides better understand of the essence of each posture and enhances the experience. The role of a teacher is to provide a safe environment for students, and to share the joys of the practice. Classes are open to all levels and are taught with compassion and attention to the student needs.